You are here: Home / Blog / Budapest / Reviews / Eros who? Nothing ventured, nothing gained. I am all for giving something a go, particularly if someone is hell bent on educating me (or re-educating me). There’s nothing I like more than rising to the challenge of having my mind changed. 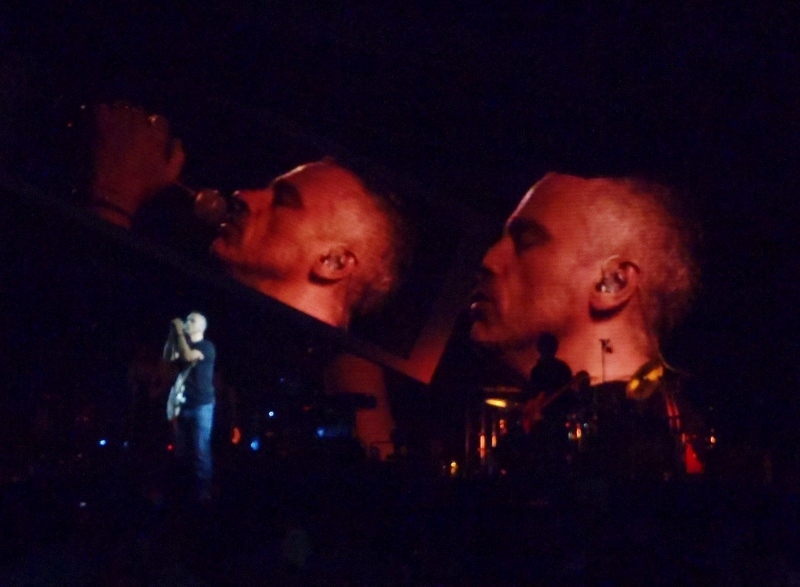 Yet when I was invited to the Eros Ramazzotti concert in Budapest last night, there was nothing there to be changed – I’d never heard of the chap. I lost interest in music when Elvis died and what interest survived died alongside Johnny Cash. My record collection (enough said) dates me. I finally heard Amy Winehouse at Christmas so I’m certainly behind the times. But yer man, Eros, is billed as the most popular Italian singer with the over 55s so I wasn’t too put out that I didn’t recognise him, facially or musically. Born in Rome in 1963, we’re not quite the same vintage, but we’re close enough. He was the first ever Italian artist to play at Radio City Musical Hall in New York – and he sold out. Mind you, apparently the audience consisted mostly of Italians so he was supposedly a little disappointed at his lack of reach. He’s currently on a 41-concert tour of Europe which is amusingly (for me, anyway) entitled NOI – Italian for ‘us’ or Hungarian for ‘women’. That he thought he was in Bucharest in his opening five minutes at the Stadion in Budapest didn’t detract from his performance. I forgave him that because the man is a genius. 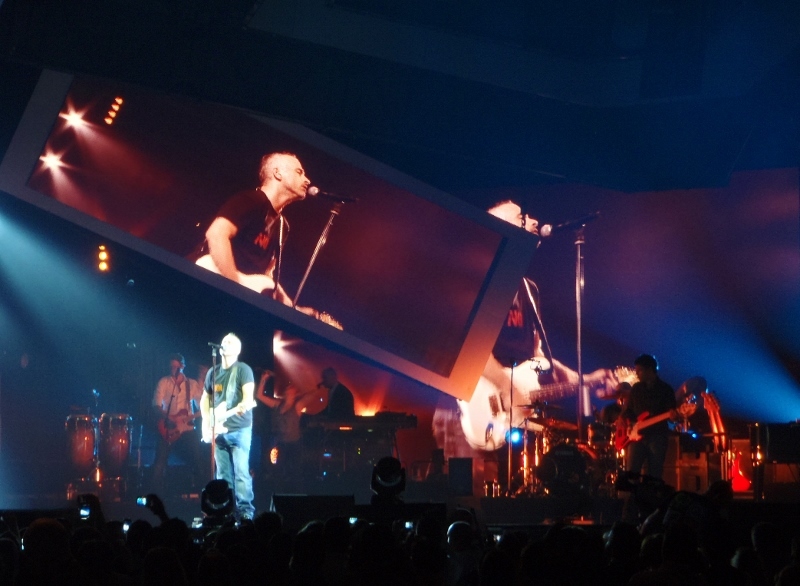 That I couldn’t understand a single solitary word he was singing was immaterial. I just imagined that I caught snippets of what sounded like English (although I knew it was Italian…or Spanish (he releases his albums in both languages)). Yet phrases like ‘I’m thinking of you, you’re part of me now’ didn’t quite gel with ‘get me out of the country’. Or ‘one more passion that we can share’ wasn’t quite in sync with ‘when you pretend, the cabbage goes bad’. And when I thought I heard him sing about a cement mixer, I knew it was either my hearing or the acoustics. Given the audience’s reaction, I betting on the former. Interestingly, all the expensive seats had sold out – and the cheaper ones were empty. Seemed like everyone there wanted to be as close as possible to the t-shirted and jeaned 50-year-old who had more life in him than lots of people I know who are half his age. And what he spent on his rig-out, he saved in shaving foam. I’d expected a well-coiffured stereotypical Italian; I got someone who would have been at home on the set of The Shield. Rumour has it that he’s quite shy and when he went to Milan barely ate at all, so scared was he to go into restaurants on his own. Damn. Wonder if we were in the city at the same time! The back-up band were amazing. 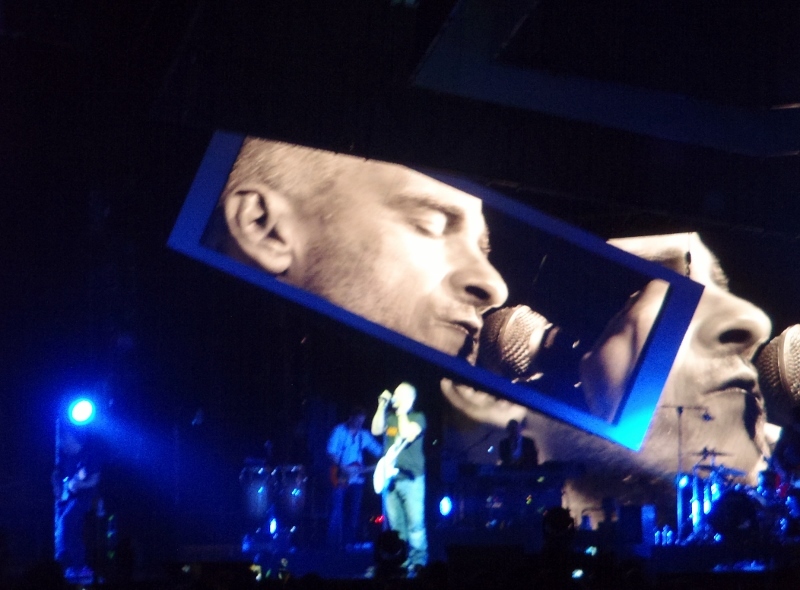 The saxophonist was worth seeing on his own and the lead guitar … well even to my deaf ear, he was something else. Had anyone told me that I’d sit through two hours catching the odd word here and there and would enjoy it immensely, I’d have said they were mad. Truth be told, I wasn’t all that pushed about going. In actual fact, only one of the four of us was really into him, yet by 10 pm, we three naysayers were converts. 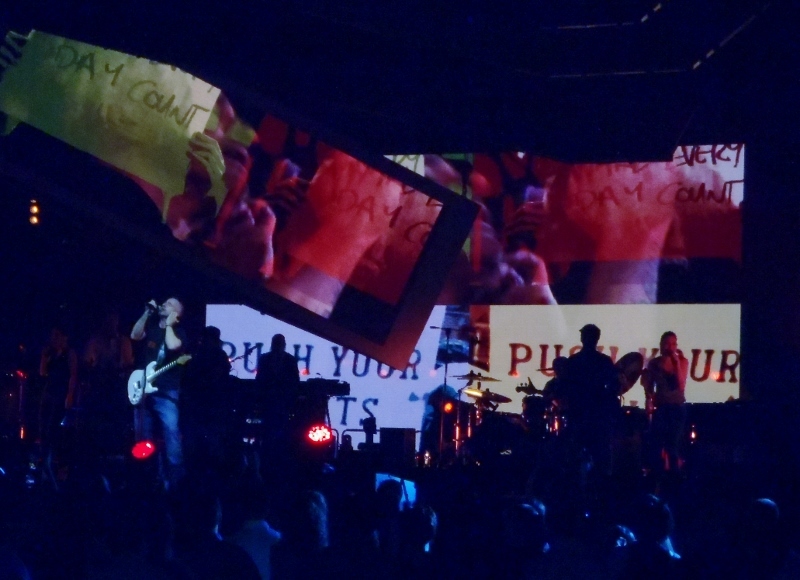 The one song that really got to me (and I can’t for the life of me tell you what it sounded like or what it was) was the one with the video montage urging us to ‘make every day count’. That resonated. For many reasons. I’m sure no more than 30% of the audience had a clue what was he was saying and yet people were singing along regardless. When I think of how that same audience is pretty clueless as to what the leaders of the country are saying half the time (they, too, seem to speak a foreign language and as paper will take any print, it’s getting harder and harder to know what to believe! ), I was struck by what was missing from Hungarian politics – passion and truth! Eros has both… in spades. Yes, the stage effects were flash and brash and required sunglasses. And yes, the show was a show. But still, despite this, he came across as a man to be trusted; a man of the people. He came down into the crowd and high-fived his way across the front of the stage. He seemed genuinely interested in his audience and when he introduced his band, the camaraderie was evident. He has duetted (is that even a word!) with the likes of Cher, Tina Turner, Andrea Bocelli, Patsy Kensit, Anastacia, Joe Cocker, Ricardo Arjona, Luciano Pavarotti, Laura Pausini, and Ricky Martin. And yet I’d never heard of him until a month ago. Sporting a tattoo on his forearm AURORA, which, as it turns out, is the name of his first daughter, now 17, he really is a likeable lad. He did a six-song encore and then left the stage and broke my heart. Not because he was gone, but because his parting shot was ‘Budapest, we love you!’ Why oh why oh why did he have to resort to such trite! Maybe there is a politician in him somewhere. That aside, he made me some memories… and for that I say ‘grazie, grazie mille’. https://unpackingmybottomdrawer.com/wp-content/uploads/2017/06/logo-300x82.png 0 0 Mary Murphy https://unpackingmybottomdrawer.com/wp-content/uploads/2017/06/logo-300x82.png Mary Murphy2013-05-09 01:20:012016-08-10 11:41:38Eros who?